Questioning Advice | Mediterra - Swim & Run Better Than Ever! 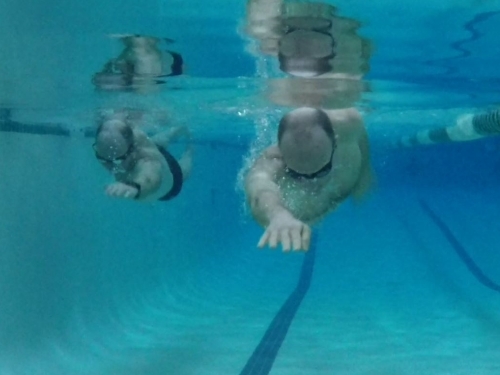 Recently a swimmer in our Dojo wrote about encountering his former swim coach at the pool. She happened to observe his latest stroke, admired a few points and then began to give him some advice, urging him to change certain things. Upon reflection this advice caused him some confusion because it didn’t fit with improved understanding of how skillful swimming works. At this point in time he was in position to think and question her advice. She started telling him to change certain details, although (from how the story was described to me) she did not ask questions to find out what he was currently working on. She imposed her own view of what she though he should be doing, what effect he should seek, without taking time to understand his immediate training goals and context. In his own mind he felt he should at least listen to her because she was his former coach and noted, “she swims with lots of force herself, but nevertheless it looks quite ok”. Let’s think about that statement for just a moment. He made an important observation about her qualification to offer advice. What is the system this coach’s advice comes from? In one way this coach had an admirable stroke appearance but the high price she pays to swim that way was also obvious to this swimmer. If you had the choice between a beautiful and fast stroke which cost a lot of energy and one that cost a little, which would you choose? Swimming forcefully wears on the body, just like driving a car forcefully wears on the engine and mechanical parts. If you learn to drive from someone who treats a car this way, you can expect to have your car experience the same kinds of distress. How can following the example and advice of a forceful swimmer lead to a different result? When considering advice from a swimmer or coach it’s suitability for you cannot be judged merely by its speed or its beauty – you must also consider its cost. Most of those people who choose to swim at high expense (they say, “I just want a hard workout!”) will eventually run out of resources. Eventually something in the body or in the mind of this swimmer will call it quits when these can no longer keep up with the forceful manner. Wasteful swimming does not only mean one burns through her fuel faster, it also increases risk of injury – all that energy going in the wrong direction will have a cumulative negative effect. If you happen to go to a pool with a common masters swim group – where force is valued more than technical precision – listen to their banter and notice how much they talk about their injuries. In these groups such rate of injury is regarded as normal, even admirable – a sign of hard work. But I argue that it should not be normal, it is not necessary, and it is not admirable – its foolish. It’s an indication of ignorance about taking care of the body and reaching one’s true healthful potential. Like any long-time swimmer, this coach has achieved her form through a certain way of swimming built upon certain values. If she has little or no injury from it, she is one of the few lucky ones, and would feel no incentive to change her ways. Her values for swimming and training line up. But if you want to take her advice then make sure her values match your values so that you may have confidence it will lead you where you want to go, for the price you are willing to pay. Her advice will naturally reflect the pathway that leads to her kind of swimming, and her pathway will involve the cost she has been willing to pay. You may expect a similar outcome on that path. When judging advice from a well-intentioned swimmer or coach – and I do believe most have the best intentions – you’ve got to view that advice within the context of the whole value system she swims and trains and coaches in. When you internalize a piece of her advice, you absorb a piece of that system as well. If you’d like a more thorough discussion of my viewpoint on this you may read Judging Stroke Advice and Judging An Efficient Stroke. It is tempting to do so in this market of a thousands of pieces of swimming advice in every magazine and on so many websites – one might try to mix-and-match pieces of advice if he feels wiser than the coaches involved (which some of you may be) but I don’t recommend this for most people. First, find the system that had produced results you admire at a cost you are willing to pay. Make sure that program matches your vision and values. Be responsible – to take the time to master that program first, before tinkering with ideas from other systems. You will then be in a much better position to assess the advice you receive from all those other sources and judge its suitability to your needs. Mat, your words are so wise! I completely agree with you! I can see something like that at my pool … swimmers who struggle to chase the best one when it is so evident that training session is not suitable for them! They can reach better level but gradually, by training differently. They would also learn how to have more fun.